At a time when state government is focusing to conduct two tier panchayat elections nearly after a decade time the demand of conducting three tier elections is still on high in Darjeeling Hills. Morcha the ruling party in Darjeeling has been demanding three tier panchayat elections but recently in Darjeeling GJM supremo Bimal Gurung aid even if the Bengal government went ahead with two-tier panchayat elections despite its opposition, the party would take part in them. 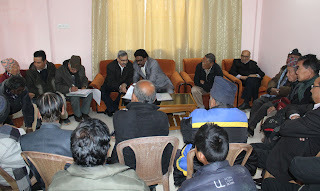 Today too the Darjeeling District congress committee demanded a three tier panchayat elections in Hills. The statement came from the Darjeeling District Congress coordinator Dilip Pradhan said “ We want a three tier panchayat elections in Darjeeling area. He said what is the problems when Central, State government and the GJMM have signed the GTA agreement where they have all agreed to conduct three tier panchayat in the Act. He said it’s their responsibility to conduct the election as they need to amend the constitution. He said we want municipal elections to happen soon as all hill municipality term have finished and now are been run by state appointed administration. A congress party meet was today organized in Kalimpong where Md Nurul Huda ,Standing MLA of congress party from Assam was present . In his presence two committees, district campaign committee which will campaign against the decision of demonetization and District Implementing committee was formed which will implement the central program of Congress party in the District. Elections to gram panchayats were last held in the hills in 2000. For the three-tier panchayat elections, a constitutional amendment is needed. This is because in 1993, Article 243M was amended to pave way for a two-tier panchayat system for the area which was then under the jurisdiction of the Darjeeling Gorkha Hill Council. However, the constitutional amendment has not yet come through. 0 Respones to "Congress demand three tier panchayat polls in Darjeeling"